Lest you believe that there are no drummers other than Gene Krupa, it is appropriate that we occasionally look at the artistry of other percussionists if only because some of them are featured on these pages. Buddy Rich has been a hero and an idol to many of us, regardless of our age or level of talent, and there’s a good reason for that. 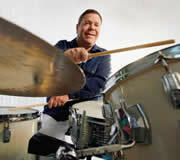 To these ears, Buddy Rich was, is and will always be the greatest drummer who ever lived. Like many of you, I saw him in person hundreds of times and probably have every record he ever recorded and almost every piece of video and film with his image on it. Technically, he was simply inhuman. More importantly, though, with rare exception, he swung like mad and drove and spurred on players to play way above themselves. And this happened in a wide, wide variety of circumstances, from his own big band to the Tatum/Hampton/Rich trios. Still, through the years, he wasn’t always the darling of critics. “Too loud,” “too heavy,” “no taste,” were some of the comments offered through the years by the music writers. One fellow went as far as to liken Buddy’s drumming to “a Las Vegas act.” Most of those opinions and quotations have been long forgotten. But there is one set of criticisms that won’t go away, and that concerns Buddy Rich’s participation in a legendary recording session. “Bird and Diz” was recorded on June 6, 1950 in New York city for Norman Granz’ Clef label, and featured a dream lineup of Dizzy Gillespie, Charlie Parker, Thelonious Monk (the only time Monk ever recorded with Diz and Bird), bassist Curly Russell and Buddy on drums. Some of the comments about Rich’s drumming on this session ranged from the mild, with terms like “stylistically inappropriate,” to the downright mean. One writer accused Buddy of trying to “sabotage” the session, and another went a step further by saying Rich’s sounded like “a refugee from a drum and bugle corp” on this date. Now a compact disc with many, many alternate takes and false starts; “Bird and Diz” remains very much in print and continues to be reissued from time to time. This recording, in LP form, was among my absolute favorites through the years, and I’ve just pulled it out again for yet another careful listen. The truth of the matter is that, yes, maybe Roy Haynes, Max Roach or Stan Levey would have been more “stylistically appropriate” for this recording, but Buddy’s presence makes it so much more interesting. Leave it to Norman Granz to mix all the different styles and “see what comes out.” It’s a shame that’s not done more today. Buddy’s bop? It’s common knowledge that Buddy wasn’t thrilled with bop or bop drummers initially (Mel Torme’ said that Rich called them “fumferers”), but he dealt with his share of boppers in his own early bands, which included players like Alan Eager, Terry Gibbs and Johnny Mandel. Whether he liked it personally or not, he was certainly listening to bop, and it’s clear that the assimilated some of the language of it, at least those parts of it that he felt comfortable with and fit in with what he was doing. And in terms of being able to “hear” what was going on musically, however progressive it may have been at the time, it is important to remember that Buddy Rich could “hear” virtually anything. 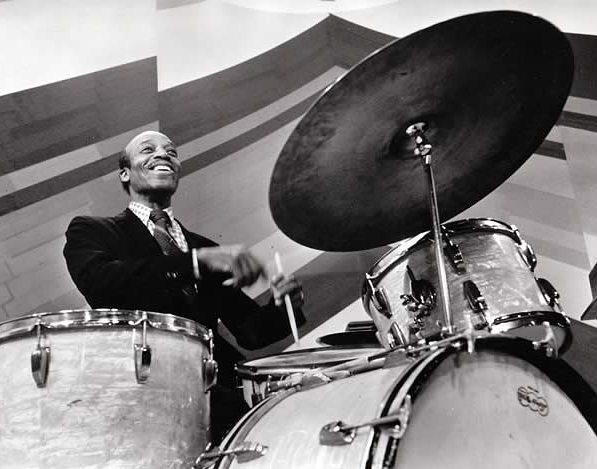 Rich’s drums were never that well recorded on his many 1950 Verve/Clef/Norgran dates, and his sound tended to vary from recording to recording. On “Bird and Diz,” the drum and cymbal sound isn’t great, which may have led some of these music writers to hear things they weren’t really hearing. Then, too, we must remember that this was 1950, long before the advent of high fidelity. Some of the problems, false starts and breakdowns on this recording were attributed to Rich. But listen carefully to what’s going on in the studio. Monk and Dizzy have their share of problems, and Curly Russell, though a good bassist who played on hundreds of bop sessions, is clearly no Charlie Mingus or Ray Brown in a rhythmic or tonal sense. If Buddy Rich exploded here and there on this record, I’d say it was because of frustration. And no, in 1950 he was not fully comfortable with the be-bop language, but he was getting there. Remember that be-bop drummer he met on record in 1959? And remember the outcome? This entry was posted on Thursday, February 10th, 2005 at 11:35 am	and is filed under CDs, DVDs, Musicians, Stories. You can follow any responses to this entry through the RSS 2.0 feed. Both comments and pings are currently closed.